Audio enhancement and mastering Phil Hardman. 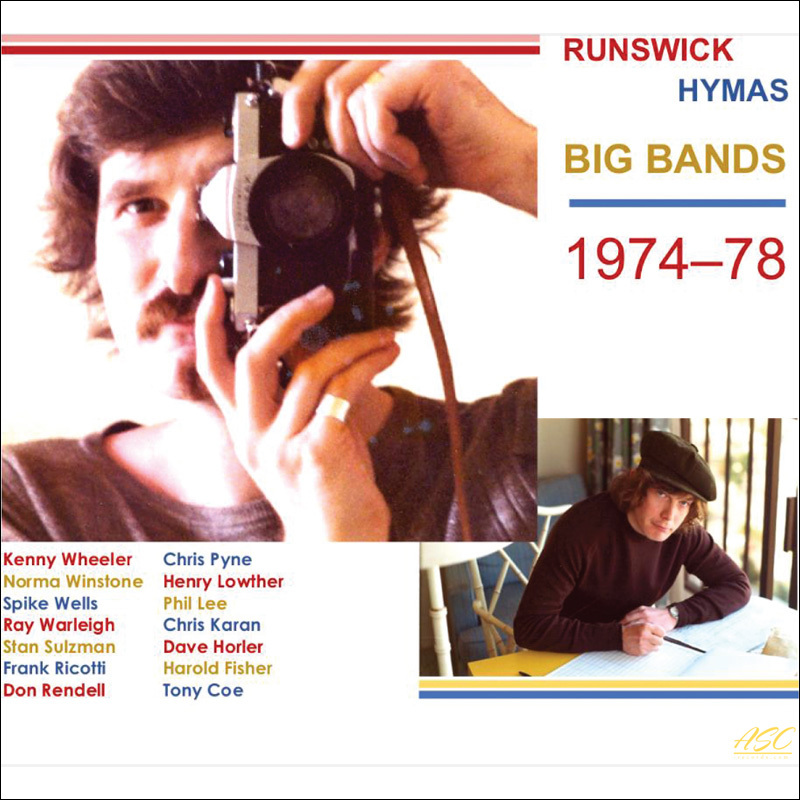 "I can't recall which of us, Tony or me, came up with the idea of the Tony Hymas - Daryl Runswick Big Band, but being constantly on tour together with Cleo Laine and John Dankworth from 1973 onwards I expect the wheeze just emerged. We agreed on the lineup: rhythm section (i.e. us, plus drums), then three trumpets, two trombones and three saxes. We added two unconventional instruments, a french horn and a tuba, and a vibraphonist who doubled percussion. Then we just booked all our mates as the players. I got enthusiastic and quickly penned (actually I pencilled them as I always do) six pieces, all of them re-arrangements of tunes I'd already composed. 'Re-arrangements' is perhaps too thin a term: these were expansions – re-compositions, almost. In the end only three got recorded. Tony provided When The Bough Breaks – as usual with him a marvellously tangential piece showing off his lyrical genius – featuring a remarkable full-band chorus at the end with no rhythm section accompaniment. Like Hindemith only better. Best piece in the set, actually. The band was planned to be a regular working unit and Tony and I were imagining an Arts Council Contemporary Music Network tour of the UK just for starters. Unfortunately neither of us was an entrepreneur – our bragging skills were always strictly inter-personal – and despite our efforts (I remember dragging Tony in to see John Wolff of the Park Lane Group) this date was to prove the band's sole outing. I won’t go into further detail about the music except to say that if you bought ASC 167-8 (Daryl Runswick, The Jazz Years) you’ll already have a quartet version of Lainey’s Tune: and you’ll notice that for the big band arrangement, as a backing toward the end of Don Rendell’s solo, I’ve scored out a few bars of Alan Branscombe’s original piano improvisation. The story of Señor Funk is curious. It was the brainchild of Denis Preston (1916-79) the legendary jazz record producer who brought Humphrey Lyttleton, Stan Tracey, Joe Harriott, Tony Coe and Indo-Jazz Fusion to the public, among many others, in a career spanning decades. He even had his own record label under the EMI banner, Lansdowne Jazz. In 1978 (this is my best guess as to the date but my diaries for the period are lost) he got in touch with me about a new project. His latest discovery was Mike McKenzie, a Guyanan pianist / singer who had a residency at a nightclub in Mayfair – Berkeley Square, if I remember correctly. Mike was to be the nominal bandleader though the actual musical director on the recordings would be me, and I would supply all the charts. In a further twist, Denis prescribed that the musical style was to be Latin Fusion in the manner of Carlos Santana. What this had to do with Mike McKenzie and his cocktail jazz I never worked out. I just took the gig. The Latin Fusion tag was good enough for me, though I hadn't expected three drummers. Denis assembled an eclectic but stellar band for me to write for – surprisingly not including Mike McKenzie. He was brought in when the tracks were almost complete, to overdub a backing vocal here, a piano improvisation there. It was all very strange: but I kept my cool, put on a suave face and out of this melange somehow managed to weave some pretty acceptable music. As arranger I went to town as I had with the Hymas-Runswick band. The album was recorded – with spectacular playing and wonderful soloing from everybody, including the much-underrated Mike McKenzie – mixed and mastered, and we awaited release. Then came the news that Denis Preston had died. The record never came out. I rescued a set of test mixes from Lansdowne Studios when they closed some years later. This is the music's first exposure to the public. I hope you enjoy it."